'Avventura'? Thats the Italian version of the word 'Adventure'. Fiat made the global premier of Avventura in the country today. The Punto EVO based crossover gets a starting base price of Rs. 5.99 lakh for petrol and Rs. 6.89 lakh for diesel. So is it just a faux cross' like VWs and Toyotas or it has got the crossover guts to take on the Ford Ecosport? 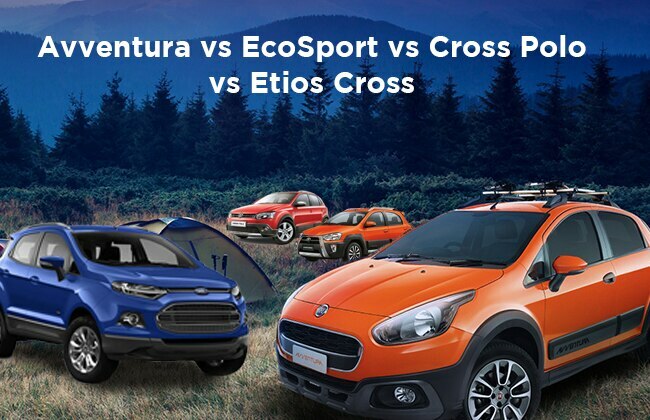 Lets see how on-paper Avventura confront – VW Cross Polo, Toyota Etios Cross and Ford EcoSport. With respect to dimensions, EcoSport is the longest and the widest vehicle here with an overall length of 3999mm and a width of 1765mm. Fiat Avventura stands second when it comes to overall length - 3989mm but is not as wide as others at 1706mm. Cross Polo comes third with 3987mm of length but it is the narrowest car here with 1698mm of width. Etios Cross is the second widest car here next to EcoSport with - 1735mm width but is the shortest here with 3895mm of length. Adding on the design front, apart from the all-around body cladding which is common in all these cars - EcoSport and Avventura are only two vehicle here sporting a rear mounted spare wheel, making them look apart on the road compared to the rest two. EcoSport and Avventura also ride higher than rest two; out of which, Avventura has the highest ground clearance of 205mm closely followed by EcoSport at 200mm. Moreover, Avventura gets all the flamboyance from the recently updated Punto EVO hatch, it also packs segment first LED taillamps. Avventura and Etios Cross rides on machine-cut alloys but Toyota and VW offers 15-inch radials while Fiat offer fatter 16-inch ones just like the Ford. But apart from all, EcoSport is only vehicle here which is designed from scratch rather than beefing-up a hatch, though it shares platform from Fiesta. Speaking of the interiors, Avventura is certainly the most feature rich car here with few segment first features like, ambient lighting (similar to the one in Punto EVO), rear air con vents, soft touch dual tone dashboard - grey (soft touch alcantara-esuqe fabric) and black. Speaking of the audio system, only Avventura, EcoSport and Cross Polo offer voice activated Bluetooth enabled system while Etios Cross offers no voice control but features Bluetooth enabled unit. Having said that, EcoSport here has the most advanced audio unit with non-touch 3.5 inch screen – Ford's SYNC – with smartphone integration through AppLink. Moreover, EcoSport is the only car in this competition to have push button start and rear parking sensors. Adding on the upholstery, EcoSport offers black leather upholstery along with leather wrapped steering wheel, Avventura on the other hand sports dual tone fabric-leather (tan brown leatherette) upholstery but offers leather wrapped steering wheel, gearbox knob and handbrake lever. Cross Polo and Etios Cross offer fabric upholstery along with leather wrapped steering wheel. EcoSport, Avventura and Cross Polo offer automatic air conditioning while Etios Cross offers manual unit. Most powerful vehicle here is the VW, atleast on paper; though the power of Cross Polo is similar to that of EcoSport and Avventura but it's the torque - 230Nm - that's class leading. But sadly, it is only offered with a diesel motor. Speaking of the petrol, EcoSport is the sole vehicle here that offers a turbo charged petrol mill – 1.0L EcoBoost (the most powerful and the most efficient petrol engine in the lot - 123bhp-170Nm & 18.88kmpl). Moreover, EcoSport also excels when it comes to transmissions – again the sole vehicle here to offer 6-speed dual-clutch automatic gearbox (only with 1.5L petrol). Adding on the Fiat, luckily with the Avventura company has ditched the 1.2l FIRE unit and the vehicle is only available with the moderately powered 1.4L FIRE engine. On the diesel front, Avventura gets the 1.3L MJD in 90Hp avatar. Speaking of the Toyota, Etios Cross is the most frugal diesel out here at 23.5km/l courtesy to the least powerful diesel here 67.1bhp. Moreover, it offers two petrol engines – 1.2L and 1.5L. VW Cross Polo is the only vehicle here that offers dual-front airbags as standard across the range, ABS is offered in top trims. Ford Ecosport is the only vehicle in the lot that offers six airbags (not standard) along with ABS. EcoSport 1.5L petrol Titanium AT also offers ESC – Electronic Stability Control, TCS – Traction Control System and HLA – Hill Launch Assist. Moreover, EcoSport also offers Emergency Assistance – the system calls emergency services in case of any casualties. Avventura on the hand offers dual-stage airbags along with ABS (nothing standard) and FPS – Fire Prevention System. Toyota Etios Cross offers standard ABS (only for diesel variants) along with dual front airbags that are only offered in the top variant. Like we said, though it competes with Cross Polo and Etios Cross, at the end of the day it all drills down to EcoSport and Avventura. For American's EcoSport is an 'Urban SUV' while Italians calls Avventura as a 'Contemporary Urban Vehicle' (CUV). Fiat has somehow managed to undercut the pricing of EcoSport – Avventura starts at Rs. 5.99 lakh while EcoSport at Rs. 6.49 lakh while Fiat maxes out at Rs. 8.17 lakh while Ford at Rs. 9.70 lakh. Having said that, EcoSport is the most feature rich car here so its prices justify while Avventura seems to be right with what it offers at this price. So, could Avventura turn around Fiat's fortune in India – time will tell!